I picked the perfect week to be out of town. Actually, I didn't pick it; Grace did. 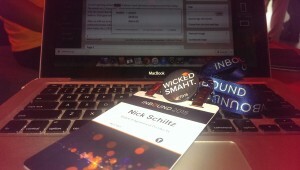 I'm writing to you today from Boston at a little marketing conference called INBOUND. Myself and Marketing Manager, Adam, along with 14,000 other individuals from around the world are attending this conference for inspiration, education, and connections. Authors, comedians, TED talkers, and professionals from all walks of life have come together this week to specifically blow my mind. We arrived in Boston Monday night, had a late dinner, and went to our respective hotel rooms. As I was getting settled in, I put my phone on the charger, as it had been dead for several hours. 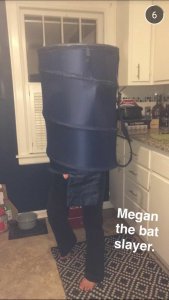 With no other context, I receive a message from my significant other, "There is a BAT in the house!!!!!!" Stunned by this revelation, I responded, "How?! ", to which she informs me that her sister was just leaving when it swooped over her head in the living room, causing an earth shattering scream from the girls in the process. I sent her a picture of my credit card, with the only caption being, "Do whatever needs to be done." She arranged for the exterminator to come out yesterday to assess the situation. At this point, I was in training and my phone was on silent. I emerged from the class feeling refreshed after four hours, not even thinking about a bat in my house. I check my phone and the anxiety floods in as I see I have several new messages, reminding me of the reality that is the joy of home ownership. Apparently, I have not one, but a "colony" of bats in my basement, or excuse me, their "lair". Unsurprisingly, I was recently chased down by a bat on a hiking trail in New Mexico with my family in broad daylight, which is a huge red flag for a sick bat. So I'm hoping these trials will serve as my origin story of becoming a superhero... Although Adam advised me not to let the bats bite me, as that is not how Batman got his powers; he's just a billionaire proficient in martial arts. Right, that was Peter Parker with the radioactive spider. With my luck, I probably have one of those crawling around as well. As we're getting wicked smaht in Boston (and obviously having too much fun trying the accent on), I have a bat exterminator installing one-way bat doors in my basement with the intent that they will fly out in the evening to feed and won't be able to come back in. If all goes well, I should come home to a bat-free basement. Alas, we will not be having the traditional giveaway this week, however, if you sound off in the comment section below or email me (nschiltz@grace-eng.com) with an equally or more terrifying story (snakes on a plane, bats in your basement, etc. ), I'll be sure to get you a WICKED SMAHT pin from #INBOUND15. 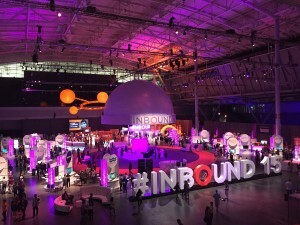 tl;dr - Training to become a marketing extraordinaire at the INBOUND conference in Boston. Learned I have bats living in my home while away. They don't pay rent, so they're currently being evicted.